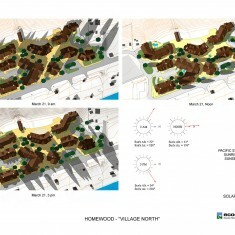 Homewood | Homewood | Ecosign Mountain Resort Planners Ltd. 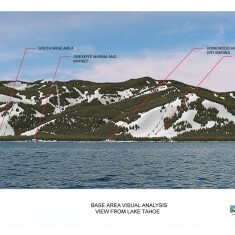 The Homewood Ski Area, on the shore of Lake Tahoe, is currently predominantly a day ski area. 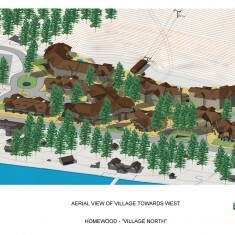 Plans for a village at the base of Homewood have been in the works for several years. 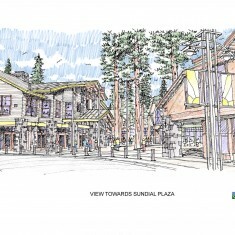 Ecosign has planned a village at the base of the ski slopes on the site of the existing day skier parking area. 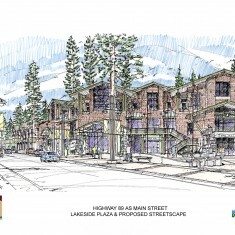 This village, which is built on a layer of underground parking, will have eight buildings that will provide warm beds for destination guests as well as a commercial and community center, which are all lacking at present. The buildings have commercial levels on the ground floor and one to three levels of accommodation above. The accommodation will have approximately 256 units and 784 beds. The improvement of the interface between ski slopes and base area is also an important advantage of the construction of the village. 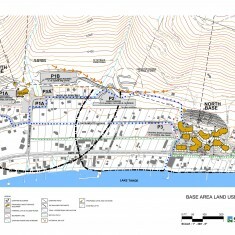 The drop off scenario along Highway 89, existing circulation patterns through the neighboring developments and connections to the lakeshore were integrated into the plans.